– in reference to the picture above, the Sacrament became one of the numerous ways around the law. 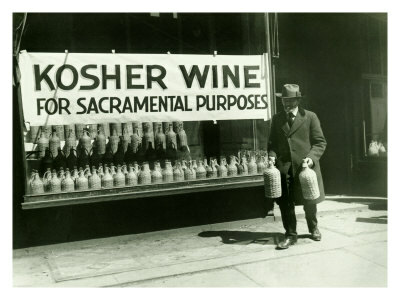 In LA, the congregation of Talmud Torah jumped from 180 to 1,000 in the first few months as it was legal to buy Kosher wine as part of the Sacrament. Faux rabbis and their “congregations” also began to spring up, many with Irish and Scottish last names. A fun new book for Michael Chabon. – In reference to how Jay Gatsby made his money in F. Scott Fitzgerald’s novel, drug stores also became huge distribution channels as it was legal to fill a medical prescription of liquor. While Walgreens introduced the milk shake, it’s more likely that “medicinal whisky” helped the company expand from 20 to 525 stores in the 1920s. Anyone who has lived in LA would be able to get a sense for this by witnessing the rapid growth in marijuana dispensaries. – Bootlegging in its many forms was a common workaround and the aspect that was most interesting was the use of international waters. The waters off the coast became the “wet” extension to “dry” land. Islands became warehouses, cruises a fun evening out and thousands of small boats could get their supply legally beyond the 3 mile mark. And of course there was a cocktail invented to celebrate, the 3 Miler. That is until the government pushed the legal barrier to “an hour’s steaming distance” at 12 miles. This eve, I’ll be making the 12 Mile Limit, a cocktail that celebrated how ridiculous Prohibition actually was. combine ingredients in shaker over ice, shake and strain into chilled cocktail glass. You are currently reading Prohibition: the most bizarre event in American history at 52 To Do.